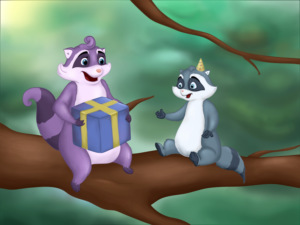 “Happy birthday, my dear child!," mummy raccoon said to her young son. “You are such a big boy now!” “Does that mean that I can go to the lake on my own to gather berries for dinner?” asked the little raccoon. 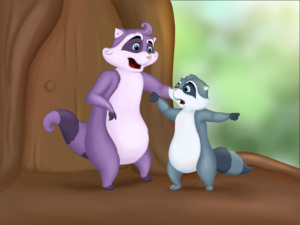 “Sure, of course you can,” mother raccoon replied, and so the little raccoon set off to the lake. 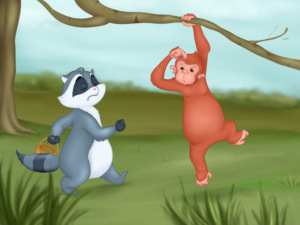 On his way the raccoon met a monkey. 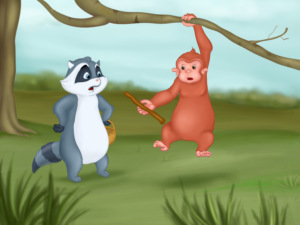 “Where are you going?” the monkey asked. 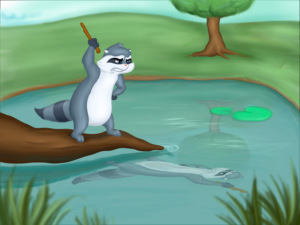 “I’m going to the lake to pick berries for dinner," replied the raccoon. 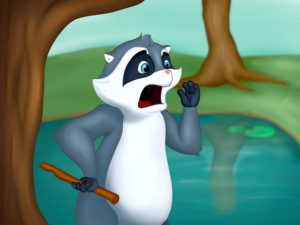 The young raccoon arrived at the lake and shouted loudly, “Hey! Is there anyone there? Where are you? Are you in the lake? Come out at once! Let me see you! Are you scared of me? !” He kept yelling, but no one came out of the lake. He then stepped on a branch which was half in the water, and looked down. 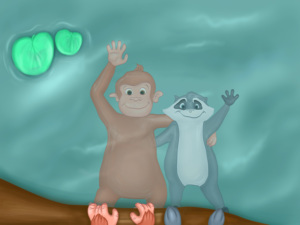 The monkey was right - there was someone in the water. And he was watching him! 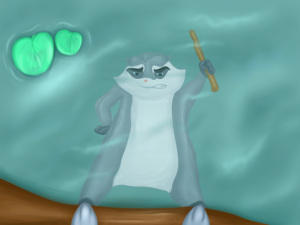 The young raccoon frowned and raised his hand with the stick in it. The person in the lake also frowned and raised his hand. That scared the young raccoon so much that he ran straight home. 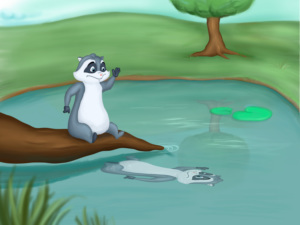 Following his mother’s advice, the young raccoon went back to the lake and did as she told him. He was astonished when the other one, the one who lived in the lake, smiled right back at him. The young raccoon calmed down and cheered up. He gathered a basket full to the brim of berries. The monkey saw him walking cheerfully by the lake. “Didn’t you get scared?”, he asked the raccoon. And it happened just as the raccoon had said. 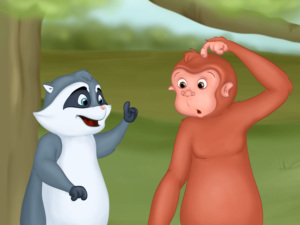 The monkey and the raccoon learned that you can make friends if you smile first.